The pickup truck after the accident. Hi, my name is Hannah Bockelman and I am 16 years old. 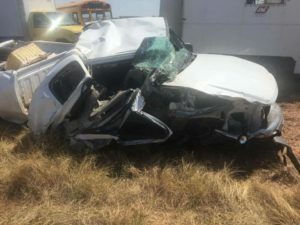 On June 8, 2017 my life took a turn for the worse, when I was involved in a severe car accident. I was with my friend, celebrating my 16th birthday. We were driving down the road when my friend dropped his wallet and went to pick it up. The car veered slightly into the other lane. When this happened, the car in the other lane swerved into our lane and hit the passenger side where I was sitting. I don’t remember much of the accident, but have been told we rolled several times. I was thrown 50 feet into a ditch. I was unresponsive when the responders arrived and they thought I wasn’t alive. From there, I was taken by helicopter to OU Medical Center. I was alone because my family had to drive three hours to the hospital. Luckily, I don’t remember that. From what I’ve been told, they started working on me right away. I spent a little over a week at OU Medical Center and then transferred to The Children’s Center Rehabilitation Hospital. Later on, I realized I was not able to feel my left side of my body. I have a C2 spinal cord break in my spine and fractures in the bottom of my back. At the beginning, I had no movement in my left arm or leg. My entire left side felt paralyzed. Each day, I began to notice changes, which were huge to me. I started to move my toes in my left leg and bend my knee. My fingers began to move. I was told with this type of injury, I would not be able to breathe on my own, talk, or walk again. Well, with prayers and lots of love I am proving them wrong! Day by day, I am getting stronger and stronger. 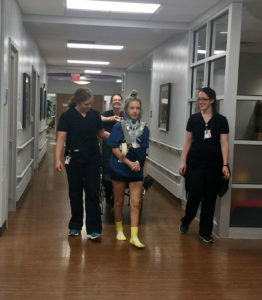 During my stay at The Children’s Center Rehabilitation Hospital, I work on strength and endurance, learning to walk again, learning to dress myself with my brace on without moving my left arm, feed myself using one arm, and brush my teeth. Each day I become more independent and getting back to feeling like myself again. I am thankful for my family and friends who have helped me along my journey and continue to pray for me. My community has been so helpful with having fundraisers and praying for me. For this, I am forever grateful. I am also thankful for the rehab team at The Children’s Center Rehabilitation Hospital helping me get stronger and pushing me to get better. Hannah getting stronger with the help of physical therapy and occupational therapy. My goal is to return to school with full strength in my legs in order to walk. I am excited to return to school and seeing my friends. I am junior class president, cheer captain, and starter on the basketball team. I also run track and cross-country and play softball. I hope to gain more strength in my left arm as time goes on. Even though this has been very hard for me, my hope is I am able to help others by sharing my story and what God has done in my life. I know I have a long road of recovery; I am a positive person and try really hard. I’m not going to quit; I am going to keep fighting until I am better than I was before. Today, Hannah is back home in Laverne, OK.